Vanderpump Rules’ Stassi Schroeder celebrated turning 30 with an amazing winter-themed birthday party. Both Stassi and birthday twin Ariana Madix dressed alike and wore crowns and sparkly makeup. The party was chill, and everyone got along. Then, Stassi experienced her annual birthday melt-down. She texted and called her boyfriend, Beau Clark, over 70 times, even though they were both in the same house. What incredible self-control, Stassi! Earlier that night at the party, Beau also endured shared some quality time with Stassi’s mother, Dayna Schroeder. Beau was treated to Dayna squeezing his booty in front of Stassi. Awkward! At Kristen Doute’s re-launch of her t-shirt line, Dayna made amends with Beau by begging him not to leave her daughter. Dayna wants grandchildren, but she acknowledged that Stassi is difficult and often drinks too much. Katie Maloney, Kristen, and Stassi hit the town for a girls’ night out with their mothers, and really, what could go wrong? Just about everything. Dayna was nuzzling Stassi’s neck and face. Then, Dayna lectured Stassi about all of her baggage, and how she will end up ruining her romance with Beau. 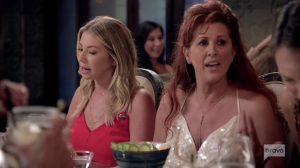 Stassi started to argue with her mother. After, Dayna erupted in an explosion of tears. Ultimately, She left the table, followed by the other moms. In another Instagram post, Dayna explained how her family membersl teases each other and they are sarcastic and dramatic. Dramatic? Color me surprised! “And that’s why people who don’t personally know us would think that I was SERIOUSLY saying those wise cracks to Beau and Stassi to be that horrible of a mother? I was trying to be “that embarrassing funny mom,” Dayna posted. Well, the embarrassing part certainly worked. Why would she “try” to be that way? Did she not realize she was filming an internationally televised reality show? Also, Dayna shared how proud she is of Stassi and all her accomplishments. “Nastassia knows how much I love her and how I think she is the most confident, smart, witty, kind hearted loving girl,” Dayna said. TELL US- WERE YOU SURPRISED BY STASSI’S MOTHER’S BEHAVIOR? WHAT DO YOU THINK ABOUT HER EXPLANATION? ARE YOU BUYING IT? OR IS SHE JUST TRYING TO SAVE FACE? DO YOU THINK THAT BEAU WILL STAY WITH STASSI? SHOULD HE STAY?